Let us sell your piano for you. Prossers is in need of good quality used pianos to sell. Click below to tell us about your piano, and to get a quote. Prossers rents pianos. Renting a piano is a great way to get your kids started playing piano. Prosser Piano & Organ is the authorized dealer for New Kawai Acoustic and Digital pianos in the Seattle-Tacoma area. Prosser Piano & Organ is proud to be the authorized dealer for New Roland Digital Pianos in the Seattle-Tacoma area. We carry a wide selection of pre-owned acoustic and digital pianos. Owning a used piano from Prossers comes with the assurance your used piano has been thoroughly evaluated by our experienced staff of technicians. Over time there have been particular instruments that have garnered a higher admiration from the piano playing community. Models from Steinway, Mason & Hamlin, Baldwin, Yamaha and Kawai along with select models of various major manufacturers are offered as an affordable alternative to new. 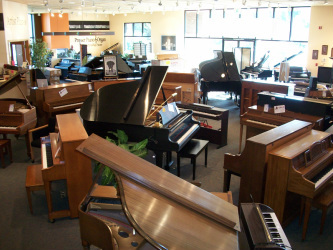 You will find a large selection of good quality used pianos to choose from one of our two Puget Sound area locations.. Contact us about the type of piano and budget range you desire and we will respond with some specific suggestions of available pianos to consider.